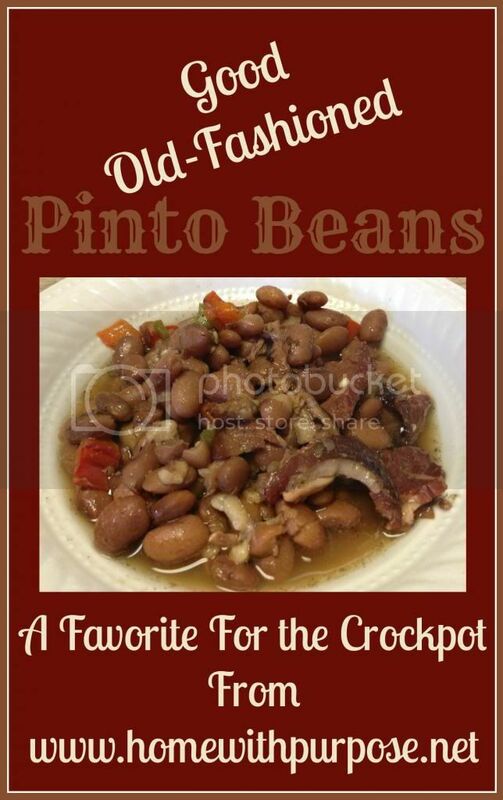 One of our family’s absolute favorite meals, year round, are my husband’s delicious pinto beans in the crockpot. These are the ultimate comfort food…they make a hearty meal as a main dish, served with cornbread and maybe a salad, but they also make a fantastic side dish. I buy my pinto beans in bulk and keep a 25 pound bucket in my pantry. They have many uses, but our favorite way to eat them is when my husband cooks a big batch up in the crockpot and I make Popcorn Cornbread to go with them. He begins by measuring out about 6 cups of beans, sorting them to remove any broken beans and rocks, then rinsing thoroughly. Next, he soaks them overnight in water with apple cider vinegar or whey added. The next morning, he rinses them, puts them in the crockpot, and adds enough water to cover them. He adds about 4 cubes of my homemade chicken broth to the water. Next, he chops a large green bell pepper, a large red bell pepper, and a large sweet yellow onion and adds them to the crockpot. He also chops and adds about 5 cloves of garlic. Sometimes he adds a couple of jalapenos…one seeded, one not, both minced…just enough to add a little “bite”. Next, he chops the bacon or salt pork and adds about a pound to the pot. Now it’s time to let the beans simmer. We’ve found that they often need very little, if any, added salt…but if we do add salt, we wait until the beans have softened to add it, otherwise they take much, much longer to soften and be ready to eat. The only salt we use is natural sea salt or Real Salt, never iodized table salt. The best judge of when they’re done is to taste them after several hours. It’s difficult to mess these up…they can cook longer or be eaten as soon as they are cooked through. We generally let them cook for at least 6-8 hours. Served garnished with shredded cheese and a side of Popcorn Cornbread, they’re the perfect meal for a cool fall evening. This is the Dancer’s favorite meal! They’re also a great side dish. Versatile and nutritious…you just can’t go wrong with these delicious beans! Linked with October Fest Carnival of Super Foods, Pennywise Platter, Fight Back Friday, Whole Foods for the Holidays. Oh, yum! These sound like a nice twist on the way I normally do beans. We'll give this a try for sure! Oh YUM!!! This is a comfort meal from my childhood. I want to go make some RIGHT now. 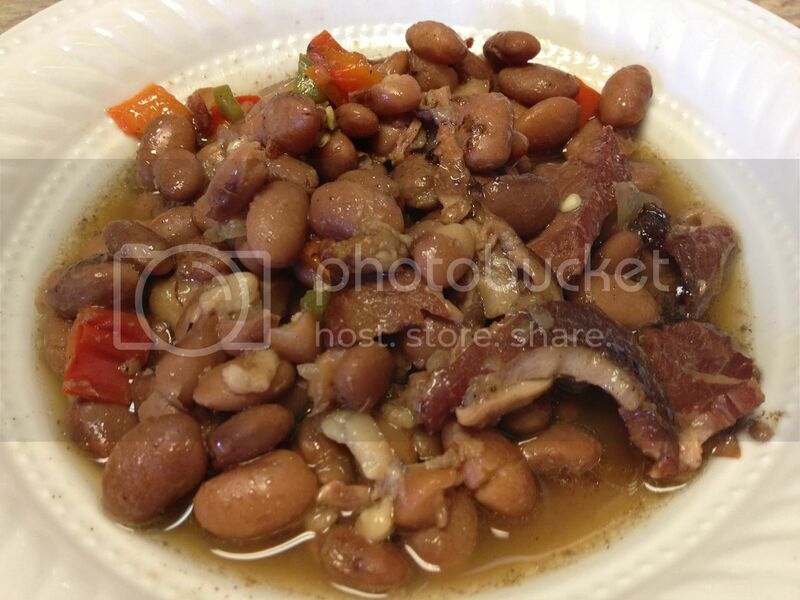 one of my favorite fall meals…beans and cornbread! We are having this for dinner tonight. It smells delicious and so easy! I love how simple this recipe is! Thanks for being part of Pennywise Platter! Where do you buy your beans in bulk at?